Though works are already going on inside Stadio Friuli, it's only now that Udinese secured majority of the funding. Club owner compared this to winning Serie A title. 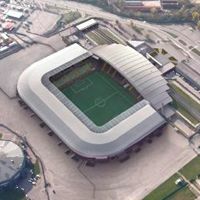 Initially thought to cost some €20-25 million ($26-33m), the redevelopment of Stadio Friuli into football-specific venue is now estimated at €40 million. To manage such a huge expense, Udinese needed to secure a safe loan that will not overcharge the annual budget. The loan stands at €25 million and has been granted by Instituto per il Credito Sportivo, also known as 'bank of sports' in Italy. The public body has been helping finance sport developments for half a century. Currently the revamp of Friuli is at an early stage. Pitch works are ongoing, while large land embankments around the pitch are to be removed in autumn. Then new stands will be built on three sides of the stadium, decreasing capacity to some 29,000 domestically and over 26,000 for international games.